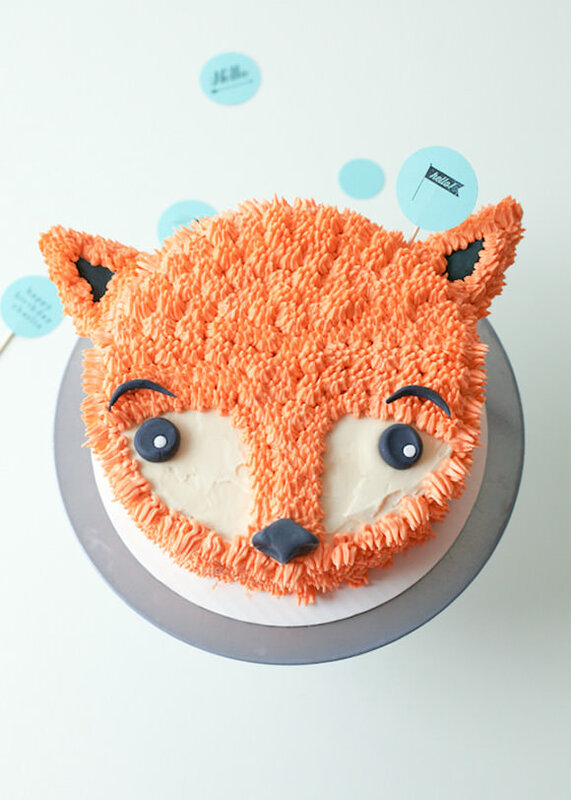 This sweet and friendly fox cake is perfect for your little one’s next birthday. It can fit into so many themes, including a cute woodland party, a Fantastic Mr. Fox movie night, or a forest friends fete. 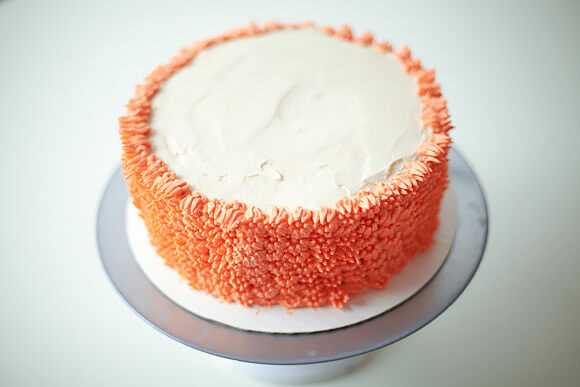 Roll up your sleeves and get your piping bag ready—it’s orange fur time! Note: Often I will make a drawing of what I imagine the final cake to look like. This helps me in creating the finished product. 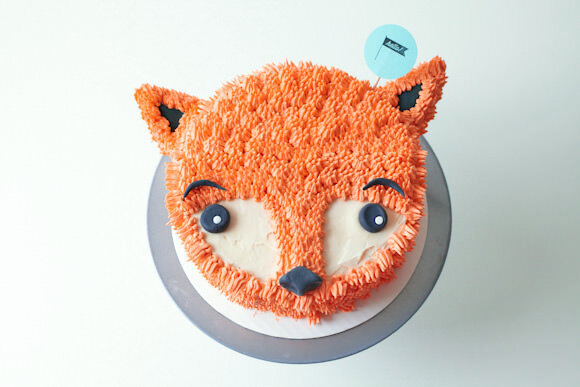 You can always refer to your computer screen for a picture of this fox cake, though! 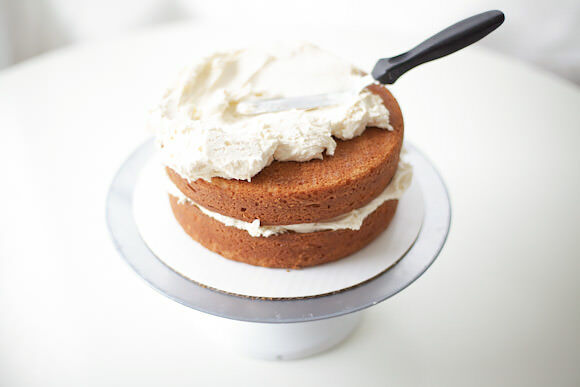 Begin by filling and frosting your baked and completely cooled cake with plain white vanilla buttercream. 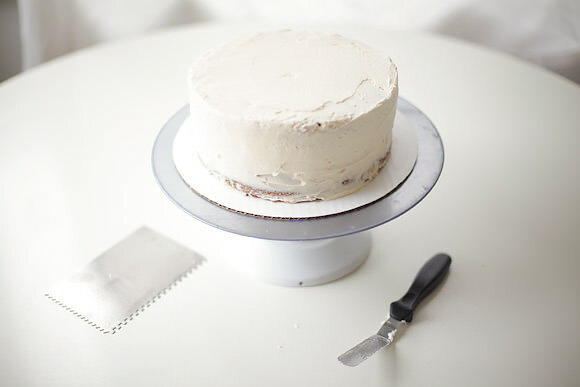 Using a bench scraper tool or your spatula to ensure the top of your cake has a smooth surface, as part of it will be exposed! 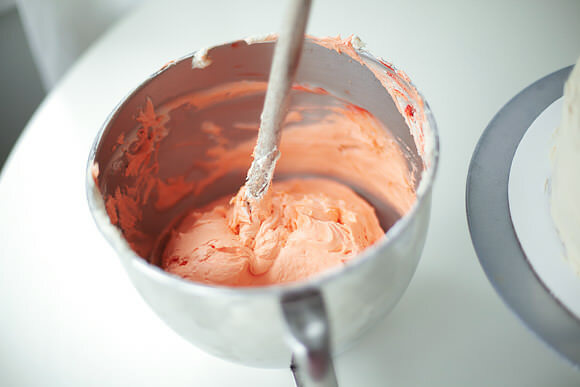 Tint the remaining buttercream orange. You can make it as light or vibrant as you like—gel color is potent, so start with a smaller amount and add more as needed. Continue piping all around the sides of the cake. 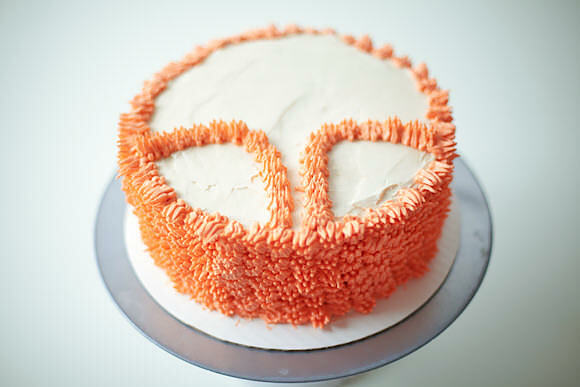 On the top, imagine the cake to be a fox face that you are staring down at. Begin piping at his chin and work your way upward in a curved line. 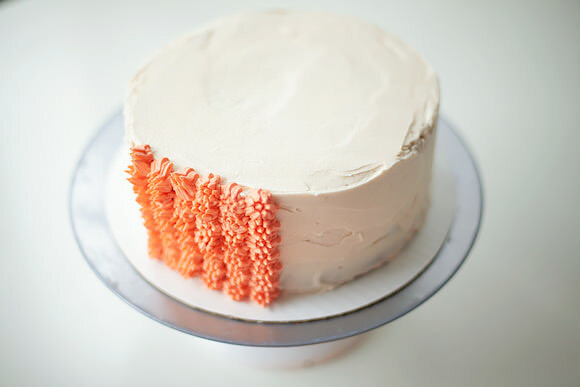 TIP: If you like, you can use a toothpick and poke a dotted line into the white buttercream as a guide for your orange buttercream piping. Using your piping bag, pipe a mirror image of the curved line on the other side of your cake face. 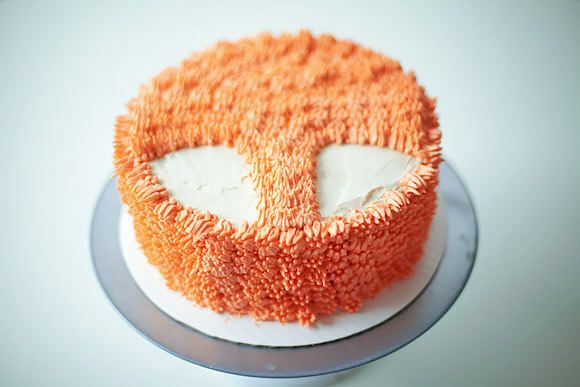 Now, continue piping and fill in the rest of the cake as shown above, leaving the fox’s cheeks as plain white vanilla buttercream. 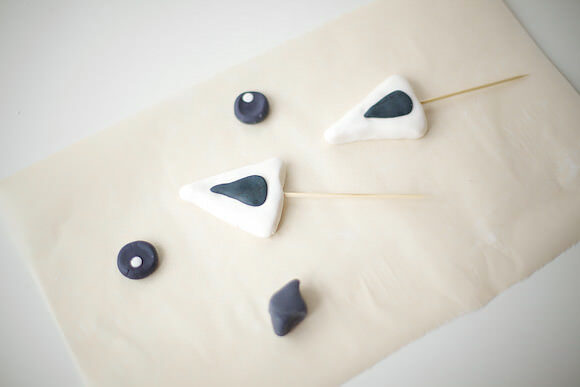 Make your fondant accent pieces! Two black flattened circles for the eyes, a black fondant nose, and white fondant triangles for the fox’s ears (you’ll be piping over the ears with more fur). Cut a wooden BBQ skewer in half, and insert a skewer into each ear. Using a tiny amount of water, adhere the black triangle “inner ear” on top. 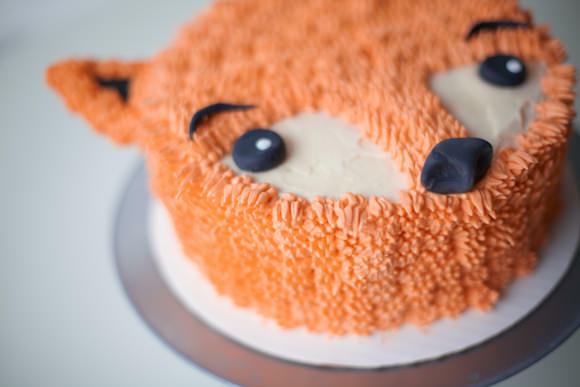 Place your ears into the sides of the cake, gently press the black nose into the buttercream, and lightly press the eyes into the white part of the fox’s face to adhere. Now, pipe more orange buttercream fur around his entire ears to cover up the white fondant, leaving the black “inner ears” visible. I also added some black fondant eyebrows for more character, and you can add a cute little message flag too, if you wish! Just look at this cutie pie! I’m in love with his foxy cute face. Let him be the hit of your kid’s next super awesome birthday party! For a woodland themed party, I think these mushroom toadstool toppers would make a fine accompaniment on some cupcakes, too. 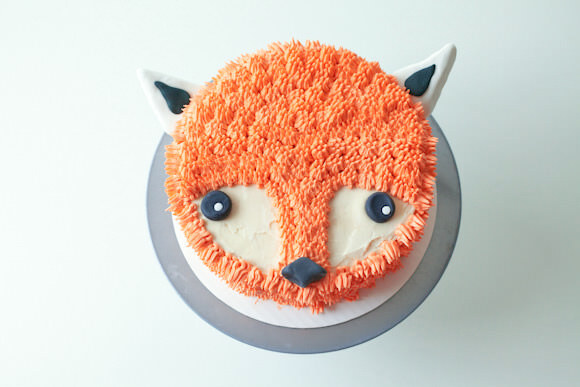 Hope you guys enjoyed this fox cake DIY. See you real soon with more cute cake insanity! This is seriously so cute! Love. LOVE this tutorial! Seriously, genius! This is the cutest cake I’ve ever seen! OH MY GOD THIS IS SO CUTE!! Thanks so much, glad you found us! 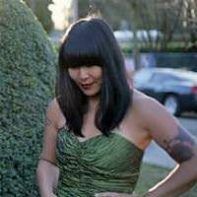 Can you post your fondant recipe please? The recipes I’m finding are in a very large batch. Thanks! 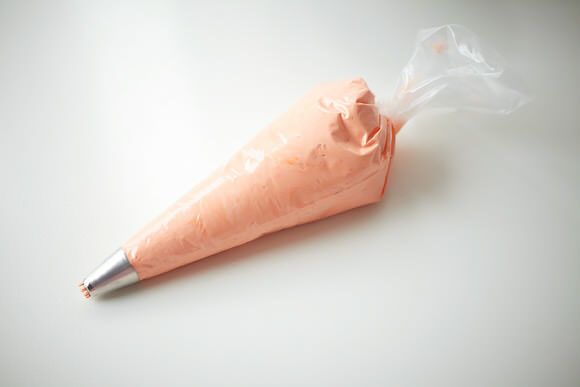 you can always make it and store it wrapped tightly in plastic wrap and then in an airtight container. or buy some premade online or at a baking supply shop, or even large crafting superstores carry it in smaller amounts! have fun! You can use spaghetti instead of wooden skewers to keep the ears on. It’s a bit safer as it doesn’t matter if people forget to remove it before they bite into them. I love this. I have never tried that type of piping though but I suppose by the time I’d done the whole cake I would have got a lot of practice. how did it turn out? thanks so much! ha – yes, that is very true – you’ll be surprised how easy it is after you pipe the first few rows. This is too adorable. I am going to make it for my son’s first birthday in December. If I make it the day before, how do you recommend I store it given it has both buttercream and fondant pieces? This is absolutely adorable! Can I ask, will this work with a cream cheese buttercream? 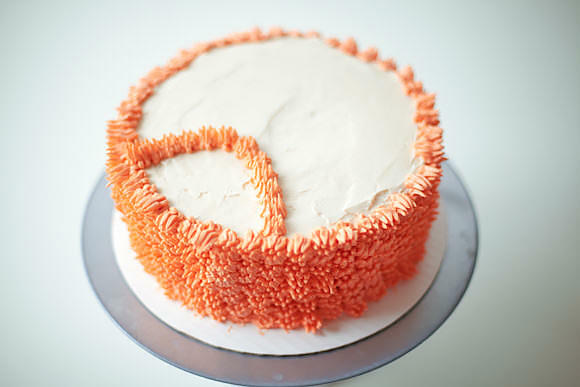 I ask because I plan on making this for my little brother’s birthday and he loves my carrot cake, so I would like to pair it with a cream cheese frosting. Thank you for this! 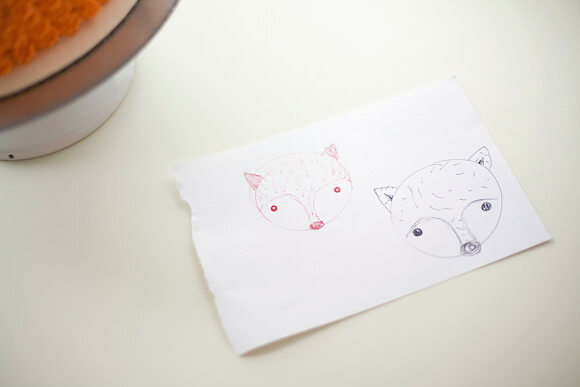 I based my daughter’s 6th birthday fox cake on your tutorial, and another photo I had. I added eyelashes and a flower (Hard to see…handpicked by my daughter). I used cardboard for the ears, with a small patch of fondant laid on the middle, with a skewer taped to the back.